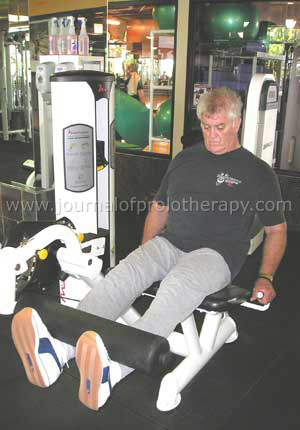 This case study discusses the case of 56 year-old Alek Jakich, an avid body builder, who suffered from chronic, severe, debilitating bilateral knee pain who was told he needed bilateral knee replacements in order to have any chance at a semi-normal life again, but was told he would likely never lift weights again post surgery. Alek chose Prolotherapy, along with proper exercise and nutritional supplementation over surgery to regain the active life style to which he was accustomed. I started bodybuilding in the spring of 1962 in an attempt to get bigger and stronger to fend off neighborhood bullies. I brought my first 160 pound barbell set home on the bus with the help of a friend. Bodybuilding quickly became a lifestyle for me that has lasted to this day. In short, I enjoy it. However, the combination of years of abuse from heavy exercise, construction work, and just plain time, began to take its toll on my knees. During the nineties my knee pain became absolutely unbearable. Like most people, I did the normal treatments. I took a lot of anti-inflammatories and went to my fair share of orthopedists. I had arthroscopic surgeries on my right knee and one on my left to remove torn medial and lateral menisci. Having endured three knee surgeries, I was in worse shape than when I went in and I was in absolute agony. The knee pain was unforgiving and unrelenting. I definitely was having depression due to the constant pain, which also woke me up frequently at night, making uninterrupted sleep a rarity. I couldn’t sit, stand, walk, or lie down without being in unbelievable pain. I was never in my life so miserable. It changed my personality, outlook on life, and worse yet, my judgment. I would virtually do anything to gain the smallest modicum of relief from pain. I was crabby to those around me. My friends and family began to avoid any contact with me because of behavior and attitude. Basically I struggled with knee pain for six years by the time I “hobbled” into Caring Medical in Oak Park, in November of 2005 at the age of 56, hoping for some help. The orthopedists (three of them) at Northwestern Memorial Hospital informed me that they had taken me as far as they could. They were referring me to another surgeon at Rush Presbyterian St. Luke’s Hospital. The surgeon at Rush announced that both my knees needed replacement. “Not to worry,” the doctor declared. After all, he was the master of the “minimally invasive knee replacement surgery.” “We’ll have you up and around in no time,” he declared. I didn’t find that very comforting. I felt that knee replacement should be held off as long as possible, and began researching my options. I was informed that knee replacements, given my activity level, would last about ten years, and to expect that each subsequent replacement would become less successful than the previous. I definitely wanted to continue to weight lift. I definitely didn’t want knee replacements! The prognosis on my knee when I walked in to my first Prolotherapy visit was not good. I had many MRIs prior to getting Prolotherapy. 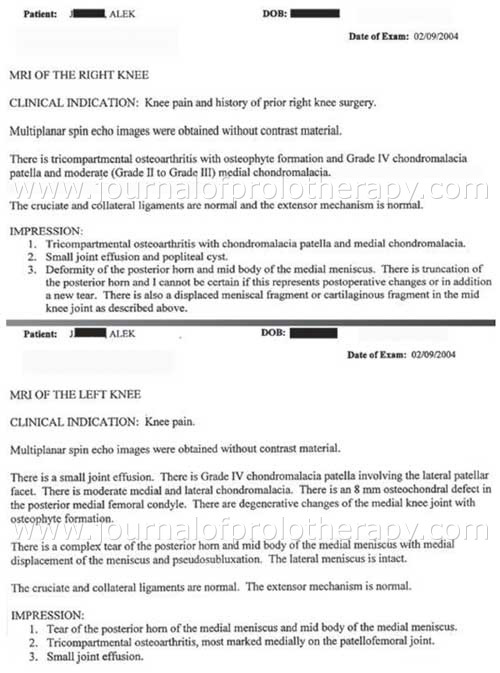 For instance, the MRIs of February 2004 documented Grad IV chondromalacia of both the right and left knees. (See Figure 1.) The MRI in 2005 also showed that the medial meniscus was a mess. These were some of the reasons that the orthopedists wanted me to get bilateral knee replacements. A popliteal cyst was found in the right knee. The surgeons were telling me surgery was my only option, other than living with the pain. Figure 1. Alek’s MRI report in February 2004. At the time of my first appointment in November 2005 with Dr. Hauser, I was in pain 100% of the time, making daily activities almost impossible. I was using a cane to assist with all walking. The pain level I experienced normally was 9 out of 10 for my right knee, and 4 out of 10 with my left knee. If I did too much, or the weather changed, the pain in both knees could easily be 10 out 10. I was miserable! Walking one city block what my knees could tolerate. Believe it or not, my maximum weight with leg extensions was five pounds at this time. On my initial visit, Dr. Hauser made it clear that to get my knees to a high functioning level, I would most likely need one to two years worth of care. I would also have to do exercise, including cycling. I was diligent getting Prolotherapy every four to six weeks, and taking the supplements Dr. Hauser recommended, which assisted in soft tissue and cartilage growth and healing. By June of 2006, I was able to walk down stairs, which I had not been able to do for years. The best part was that I was no longer in constant pain. In August of 2006, I was about 75% improved overall, and able to do 105 pound leg lifts! I continued to get treated every four to six weeks. It seemed with each visit I had less pain, more motion, and increased strength as evidenced by my being able to lift more weight on the machines. By April of 2007, the range of motion for both of my knees was almost normal. I had minimal pain but maximum function! I was doing everything I wanted to do. I could walk for miles without any noticeable “real” pain. Figure 2. Right and left X-rays, patellar views. 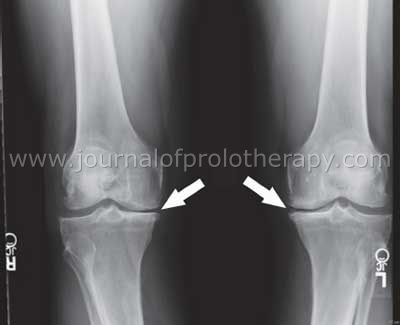 Notice significant cartilage in both knees after Prolotherapy. Figure 3. Right and left X-rays, AP views. This X-ray shows preservation of the joint spaces indicative of cartilage, though it is still compromised slightly in the medial compartment. Prolotherapy had gotten me to complete extension in both of my knees and the flexion was also full as far as I could tell. I was pain free almost all the time, only experiencing pain with long periods of standing or kneeling. Following the completion of my treatment, I went back to the physician that had recommended the double knee replacement initially. My intention was to show the huge physical improvement, specifically the cartilage re-growth in my knees the Prolotherapy had provided. I clearly thought he would be excited because it was documented in the X-rays. Unfortunately, the physician was not receptive, and I left his office disappointed, knowing that future patients would not be referred for Prolotherapy prior to surgery. It has been about a year since my last Prolotherapy session. I can now for the first time in ten years walk up and down stairs, walk around the block with the dogs, go to the movies, sit in a restaurant, and exercise my legs in the gym all without pain. 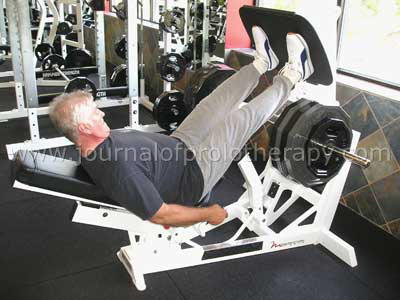 I am able do 400 pounds on the leg press machine, and 200 pounds on leg extensions. I would like to take this opportunity to thank Dr. Hauser and his incredible staff for their talent, patience, and positive reinforcement. Thank you for giving me my life back.